Pro bono work not only helps worthy clients communicate their message through design, but provides unexpected benefits for the designers as well. 1. I will be true to my profession. 2. I will be true to myself. 3. I will spend at least 10% of my professional time helping repair the world. Intentionally broad and inclusive, this pledge resonates with today’s design community as we all struggle to find purpose in our work during times of environmental, social and economic instability. Nearly 90,000 hours per year have been pledged since his book debuted at the end of 2008. How are environmental graphic designers harnessing their talents for the public good? Their interpretations of “Doing Good” — as well as the visual expressions that arise from them — are as diverse as the talents within our profession. Probably the first thought that comes to mind when exploring the idea of “doing good” is the term “pro bono” — shorthand for the Latin “pro bono publico” or “for the public good.” By volunteering their services for worthy projects and organizations, designers can craft meaningful tools to convey their clients’ messages — tools that may have been out-of-reach without in-kind donations. Designers often engage with their pro bono clients through informal introductions, but new matchmaker DesigNYC (designyc.org) facilitates those connections and curates resulting projects in the New York City area. Founded by Edwin Schlossberg, principal of ESI Design, DesigNYC recently paired The New York City Housing Authority with Rooster Design Group to collaborate on a “Green Guide” educating residents about their carbon footprint. Mirroring Berman’s mandate to “be true to yourself,” is Plain Joe Studios in Corona, California. Co-founder Peter McGowan calls the interdisciplinary design firm “very close to a ministry.” About two-thirds of the firm’s portfolio consists of environmental graphics projects for Christian churches, reflecting the religious priorities of the firm’s founders, employees, and interns. McGowan characterizes his engagements with their church client groups as “low bono or low-down-discounted design.” One-third of their work, mostly web design and development projects, are engagements with corporate clients like Nissan and provide about two-thirds of the firm’s annual income. “I wouldn’t call it a business model as much as a design ethos,” McGowan explains. Plain Joe Studios recently completed an environmental graphics program for the first permanent home of Elevation Church in Matthews, North Carolina in a renovated K-Mart. Over the years, McGowan and co-founder Mike Foster have learned how to stretch their clients’ small budgets from design through installation, even using bedframes to hold banners. From project to project, they often partner with the same fabricators who have learned how to work with volunteer labor from the congregation to install exterior and interior signage. Another unique take on blending the talents of a for-profit design firm with a passion for serving non-profits is Mark Randall’s twin endeavors: Worldstudio Inc. and Worldstudio Foundation. In the mid-1990’s, Randall started the marketing and design firm Worldstudio whose credo is “corporations hold the power to make lasting social and environmental change.” Under that umbrella, Randall and his team have produced influential work with clients such as Estée Lauder, Architectural Digest, and MTV. In parallel, he started Worldstudio Foundation to, as Randall says, “give back to the creative community” and prove that “design could reach beyond the bottom line.” The central mission of the foundation has been to provide scholarships and mentor programs for young designers. In 2006, the two Worldstudios — Randall often calls them the Brain and the Heart — partnered to create The Urban Forest Project for longtime Worldstudio Inc. client, The Times Square Alliance. 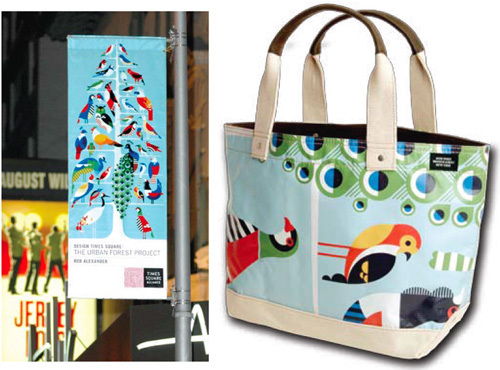 The idea was to “plant a forest of creativity” right in Times Square by soliciting designers to design banners to be hung on signposts and lampposts in the neighborhood. With a short creative brief that centered on using the concept of a tree to express an environmental issue, hundreds of designers responded: professionals and students from 21 countries designed nearly 200 banners. After delighting visitors for three months, the banners were recycled into tote bags by accessory designer Jack Spade and auctioned off, bringing in thousands of dollars for scholarships “sustaining the next generation of artistic talent” as Randall explains. The event was so successful, Randall has streamlined the Urban Forest business model into a repeatable fundraising tool, with the next Urban Forest to blossom in San Francisco this coming Earth Day. 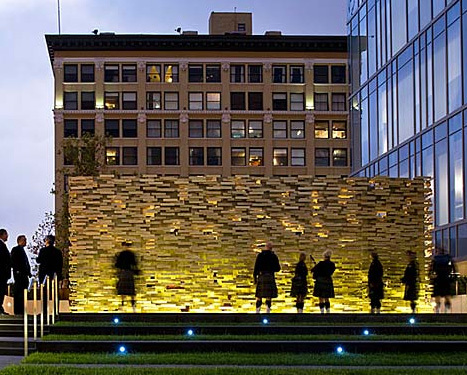 When determining which pro bono projects to take on, David Herjeczki, Design Director of Gensler LA explains “We take on projects that people might not expect a big firm such as Gensler to be doing.” A good example is the Los Angeles Police Department Memorial to Fallen Officers which opened in September 2009. The pro bono project came about through the longtime professional relationship between Rob Jernigan, Managing Director of Gensler LA and Jim Wyatt, Chair of the Los Angeles Police Foundation. Herjeczki and his peer design directors immediately sensed that this somewhat unusual project furnished the opportunity to explore a new and inclusive ideation method. “We seized the opportunity to involve everyone in the office – literally…to reinforce the idea that everyone has a voice in the design process and can and should contribute to the realization of an idea regardless of their discipline or experience.” Starting with an open call that elicited thirty ideas, a studio-wide critique narrowed the field to four concepts. “This stage also gave an opportunity for some younger staff to participate in presenting the design work to the Foundation and the Chief of Police” Herjeczki recalled. Even the later phases of the design process broke some traditional boundaries when the four design directors collaborated on the final design. “We hadn’t really worked together before, since by definition, we individually direct the design of projects. 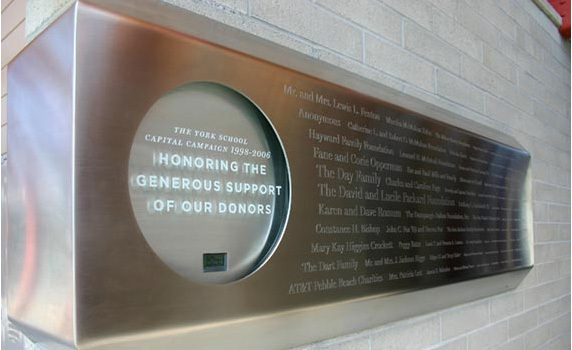 Rather than a clash of egos, this process turned out to be really refreshing and rewarding, strengthening our relationship as design colleagues.” The resulting monumental wall is a layered and shimmering abstraction composed of brass plates inspired by a police officer’s badge. Far outside the traditional design firm structure, fourteen young designers re-thought the role of design and the community it can serve and came up with PieLab, “a ‘social design studio’ disguised as a pie shop” in Greensboro, Alabama. Their simple, whimsical formula is “pie + conversation = ideas; ideas + design = positive change.” In other words, to understand how their skills can be employed for the residents of Greensboro, these designers created an informal, comfortable meeting place and started baking. The result is more than a pie shop, it’s a prototype for engaging designers directly with people who inspire them to Do Good. Leslie Wolke (leslie.wolke@gmail.com) is a consultant who specializes in interactive wayfinding and donor recognition systems.